The Top 3 Diets: Why Do They Always Win? WINNERS AGAIN – according to US News’ annual ranking of diets, the Mediterranean diet, the DASH diet, and the Flexitarian diet were the best diets of 2018. They’re likely top be the best of 2019, too, since they’ve been tops forsome time now. This is NOT news to thoseof us in the field – they’re widely accepted as terrific examples of healthfuleating styles. What else I love about them? They don’t push out any foods. You can include anything; the only issue is how much and how often. My kind of eating style, because it’s realistic. So, what’s different about them? -Add AT LEAST one fruit or vegetable to each meal, but preferably more. -WALK! 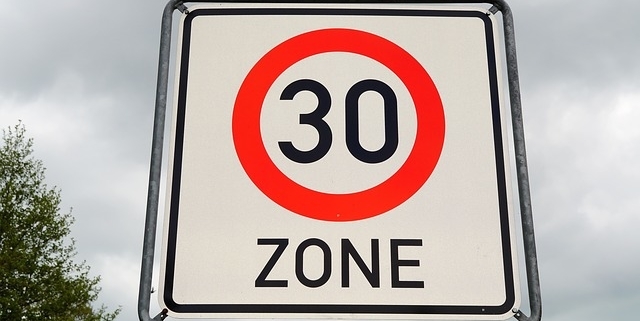 Just a little, about 15 minutes after lunch or dinner (do it anytime you can, but aim for at least 30 minutes a day). Olive oil is the fat for cooking and salads. Canola is also good, but butter is rare. It’s nuts. Almonds, hazelnuts, pistachios are typical. An ounce several times a week. What’s an ounce? Small handful – think “nibble” not ”shovel”. Something fishy? Yup. 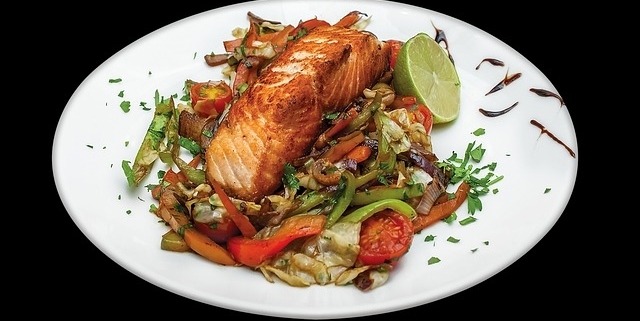 Twice a week, and make it fatty – think salmon more than sole. (Hint for economy: canned salmon is a superfood and by comparison to fresh, it’s super-economical). Low in red meat – BUT, for red meat lovers, you CAN eat red meat on this diet and there’s good research to say so. I have the details here. Includes more vegetarian meals, especially plant-based proteins. Dairy and eggs? Both OK! The diet just emphasizes including the plant-proteins, as well. Meat? Nota feature, but more of an, “it’s OK sometimes, too” approach. It’s not about strict anything, or it wouldn’t be “flex”. You’re in charge about how far to take it. If there’s a downside to the Med diet, it’s the low-calcium content. The 2015 US Dietary Guidelinesfor Americans endorsed both the Med diet and the DASH diet as excellent eatingstyles, but they acknowledged that the Med diet didn’t fully meet calcium needs. The majority of people have diets deficientin calcium – the reason calcium is a “nutrient of concern”. What to do? Talk about an example of “We’re better when we work together”! What I especially liked about this study was that it included full-fat cheese, a favorite of many, and it actually included a fair amount of it – about 1.5 to 4 ounces daily, depending on calorie needs. Yes, you can still have lean, unprocessed red meat on a MedDiet. Indeed, this Purdue University study, blinded to even the investigators, found that eating up to 18 ounces of leanred meat was not only OK, but it was MORE effective than a Med diet thatlimited lean red meat to only 7 ounces per week. Red meat lover? You’re OK, within the context of a Med diet. As for the WORST-rated diets? Those that are super-trendy, alsosuper-restrictive (Keto, Dukan, and Whole-30 lead this pack). Entire food groups excluded, rigid rules, demonizedfoods, and little science to support them – a red flag. Don’t hate them, but give them a big hug andlet them go. http://cuttothechasenutrition.com/wp-content/uploads/2018/12/Confused2-larger.jpg 648 1051 Keith-Thomas Ayoob http://cuttothechasenutrition.com/wp-content/uploads/2016/10/logo10.png Keith-Thomas Ayoob2018-12-19 12:45:592018-12-26 16:39:34The Top 3 Diets: Why Do They Always Win? So many people, clients, patients, co-workers over the years, have told me they’ve just given up trying to lose weight during the holidays – that food-festival parties, get-togethers, celebrations and general mayhem that spans the period between Thanksgiving and New Year’s Day. • Workplace food court: The constant brigade of popcorn bins, chocolates, homemade cookies, cakes and sweets, all available all day long. • Drinking: We love eggnog, but it’s the most calorie-laden drink of any year – about 330 calories in a cup. Over-boozing has calories, too – and leads to mindless eating. • Stress-eating: time is short, obligations are long, stress triggers eating whatever is within arm’s reach! • More fooding, less moving: whenever you need a little more time to get things done, it’s easy to borrow from your workouts and walks. It’s also just when you need to burn some extra calories. Ow. • Happiness can be depressing! Everyone seems to be happy but you’re so-so. You’re not alone, either. It’s easy to think food is your BFF during the holidays, and it can be – if you choose the right friends. You probably won’t gain much weight during the holidays! 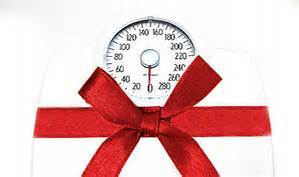 This review published last year found that average holiday weight gain in adults ranged from about 1-2 pounds in various studies, not the 5-7 pounds you may have heard about. But what about you? If holiday weight gain has been YOUR typical, changing that is easier than you think. Take it on as a project and like every project, it needs a good plan. Plans may take some of the spontaneity out of eating, but you’re trading up – for peace of mind and body. That’s totally worth it. 1. Eat modestly, but don’t skip meals. You’ll just end up being hungry and over-scarfing. 2. Weave in some fiber: Aim for 3 pieces of fresh fruit daily. Aim for 2 cups of veggies, raw or cooked. Think you can’t? You can – fill up one of those plastic take-out soup containers with cut veggies and it’s two cups right there. 3. Discriminate! Is it a regular store-bought something-or-other that’s loaded with empty calories or is it really tasty? Hold out for something really special. You’re worth it. 4. 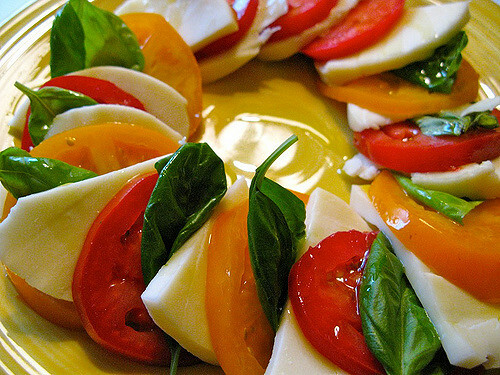 Never arrive hungry to a party:Eat some raw veggies or a piece of fruit before going to a party or social function. When the edge is off hunger, your focus is on social fun. 5. Go pro: Lean protein keeps you feeling satisfied, and helps prevent blood glucose levels from spiking then plummeting later. About 100-150 calories invested in options like turkey roll-ups, beef jerky, fat-free Greek yogurt, even a fat-free latte will pay off later. 6. Get functional: it’s a social function, so keep the priority on socializing rather than eating. 7. Be the last man (or woman) standing…in line: Always be among the last ones in line for the food. It’ll look a little less appetizing (probably a good thing) and there’s less time to have second portions. 8. Get out of Dodge: Lingering to the end encourages more nibbling. Be social, sample what you want, then move along. 9. ONE – a singular sensation! When you see something you want, have it. But one portion. One is the magic number, not a lonely number. But read #10. 10. Get “hospital-sized”: Not to eat, just to look at portion sizes. When you’re thinking of a high-calorie food, whether it’s mac and cheese or the Buche de Noel pictured at the top, it’s one “hospital-sized” portion. Keep it there and enjoy it. There will be another treat another day. Dee is an inspiration to me. She has cerebral palsy and is confined to a motorized wheelchair. She has only minimal use of each hand, just enough to move her chair and use a phone if it’s placed into her hand. She’s not only cognitively intact, she’s pretty smart. I’m lucky. I worked for 33 years with people with special needs, people like Dee. It’s emotionally difficult work sometimes, but I always got more than I could ever give them. One powerful lesson they taught me was how lucky I was to be physically able-bodied. When we think of chores, she thinks of abilities. Big wake-up call here. I speak not of years, but of minutes. Thirty minutes of physical activity for at least five days of the week is what’s recommended by the US Physical Activity Guidelines for Americans. How much do we get? The feds survey this info regularly and the latest data show 1 in 4 of us get NO leisure physical activity at all. None. That’s self-reported data, and it may be higher, as people do tend to enhance the amount of physical activity they do. Many of us cringe when we’re told to be more active. So how about baby steps? How about focusing on being less INACTIVE? If it’s too overwhelming to go to a gym (I speak not of “joining” because that doesn’t ensure “going”) or if you have little leisure time, then it makes sense to build some activity into your day, a little bit here and there, whenever you can. • Deliver it. Why email a memo to someone close by, when you can walk down the hall to speak with them? Follow-up with a memo for the record. • Think glass, not bottle. Have one glass of water at a time, rather than brining a bottle to your desk. When you want more, you’ll get up and get it. • DIY: Make a photocopy yourself, get the staples from the supply closet, give the home floor an extra quick vacuuming. It’ll get done your way and it’s another exercise snack. • TV? A 30-minute sitcom only has about 22-23 minutes of actual programming. That’s about 7 minutes of time – in 2 or 3-minute intervals – for exercise snacking. Get the playing cards, charge your phone, lay out your clothes for the next day, or even fold a few clothes. • Tidy up! Not a deep clean, just clear the coffee table, run the dishwasher, or hang that coat that’s been there since you got home. Remember, these are exercise snacks, not workouts, so you’re done after a couple of minutes, but do them several times a day and you’re on your way top getting that 30 minutes. 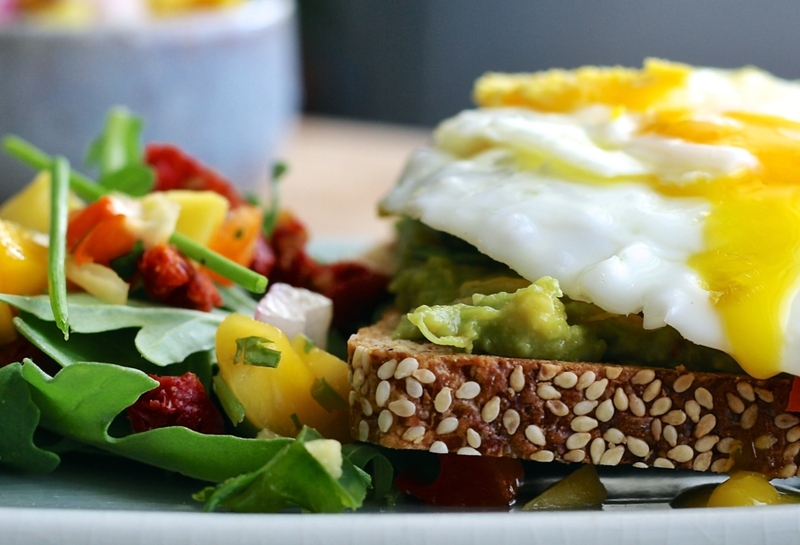 Better still, you’re preventing your metabolism from slowing down. Remember – it’s not about being more active – just less INACTIVE. It’s an easier goal to achieve and these exercise snacks might lead to bigger things, like “exer-meals”. And if you need motivation, remember: Dee would happily trade places with you. As for motivation, check this video out of a 4-year-old girl with cerebral palsy, taking her first steps by herself. You’ll cheer her on as loudly as I did. Then get up off your chair or the sofa — just because you can! If you’re of a “certain age” you’ll remember “Vacupants.” You hook up a vacuum to the hole in the special “pants” and the fat melts off. The idea was that it somehow “vacuumed” away the extra weight. You might think this could never happen in the age of digital media but you’d be wrong. It happens plenty, just differently. The food, nutrition, and diet world is loaded with sensational and extreme headlines and promises. We gravitate towards the sensational. The promise of a quick fix has a magical way of grabbing your attention and won’t let go. Most common now are diets that spout the total avoidance of a food or even entire food groups. Think about carb- and sugar-phobia that lumps empty-calorie foods together with great foods like beans and fresh fruit. Or the keto diets that demonize most carbs, including whole grains and most fruits and vegetables, and hold the state of ketosis on a pedestal. In truth, ketosis is something that should generally be prevented, not promoted. These sensational promises, extreme claims, and headline-grabbers exploit people who are vulnerable, undereducated or just misinformed. Someone with a health issue, including someone trying to lose weight, is vulnerable, even desperate for a solution, making them easy prey for junk science purveyors. Health issues are sensitive, lots of emotions are involved, making them vulnerable to quick-fixes, magic bullets, and instant cures – just the type of stuff that makes up fad dieting. Educated people aren’t insulated either. 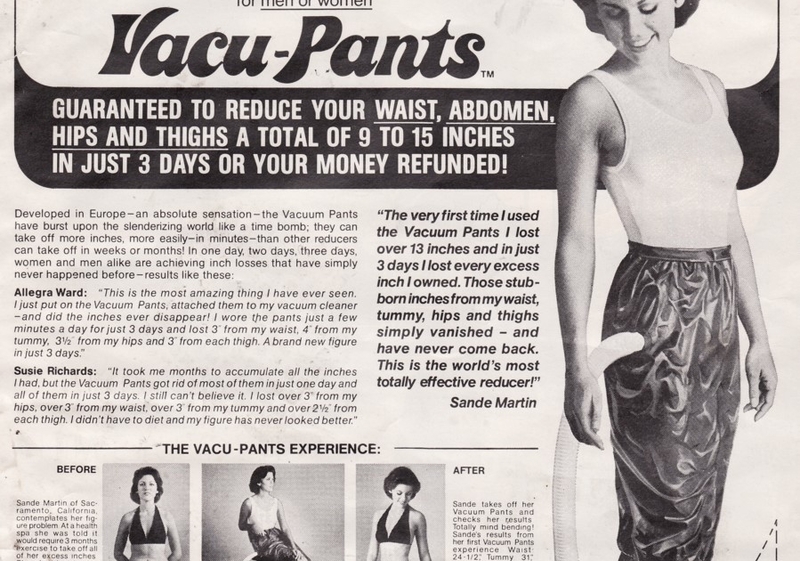 “Vacupants” was marketed as a quick weight loss method. Laugh if you must, I once had a patient, an educated woman, who admitted she’d bought this gizmo. No, they didn’t work. She’d have been better of if she’d put on some actual sweats and gone walking for half an hour a day instead. We all like being told something that fits with our values or what we’d LIKE to be true. Eating junk can be over in a flash but believing junk can continue for years. 1. Promises of a quick fix. File “miracle foods” under this one, too. 2. Danger warnings of a single food. 3. Claims that sound to good to be true. Hint: they are too good to be true. 4. Simple conclusions from a complex study. Oversimplifying often indicates taking results out of context or omitting caveats. 5. Recommendations based on a single study. If it cannot be replicated, it’s probably bogus or at least cherry-picked. Pass. 6. Statements refuted by reputable health organizations. If they’re reputable, they require solid evidence. Key word: solid. If they pass on the claim, you should, too. 8. Recommendations made to help sell a product or supplement. This doesn’t mean it’s junk, but if it’s good, check for lots of evidence and organizations that agree. 9. Research that is not peer reviewed. 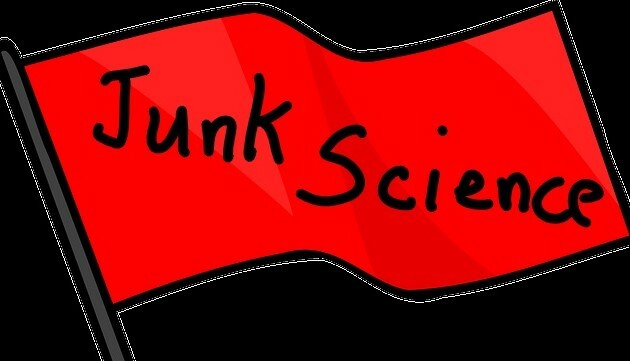 Big red flag for research that’s badly done. 10. Recommendations from studies that ignore differences among individuals or groups. There can be differences between genders, smokers vs. non-smokers, young and old age groups, the works. Eating together as a family – however you define your family – has always been a good thing, but now it’s been shown to be a healthier thing, too. This September marks the 4th National Family Meals Month ™, a campaign started in 2015 by the non-profit Food Marketing Institute Foundation to encourage families to eat together more often. • 4 in 10 (42%) said they were cooking more meals at home. As a nutrition professional, these are big wins. But the bennies don’t stop there. Read on. • Family meals are happening more often. Now 7 in 10 kids eat with their families at least four times a week. • Family meals strengthen family bonds and teach an appreciation of cultural, ethnic, and religious heritage. • Teens said that talking/catching up, and spending time with family members was the BEST PART of family meals. Huge win for families and a huge opportunity. Something that’s better for nutritional, physical, and mental health, improves social behaviors, and contributes to a family’s overall feeling of happiness is as close to a “magic bullet” as you’re going to find. They’re certainly cheaper than eating out or getting take-out. Do they take a little time to prepare? Yes, but show me something, ANYTHING, that does a better job of helping you and your family be healthier and happier and save you money. There isn’t anything better for a family than a meal eaten together. Period. So What Are the Barriers To More Family Meals? • Scheduling issues – everyone is in different places at meal times. • Too tired to cook. Takeout or eating out seems easier. • Too time-consuming to make meals. • Too many distractions: social media, TV, homework. Have you noticed that this nutritionist has mentioned very little about things like calories, fats, and added sugars in this post? I’m actually less interested in what you serve than the fact that you’re eating together. Get the family meal ritual down first. The research has shown that once more family meals start happening, the quality of the meal starts advancing: more fruits and vegetables, fewer empty calories, less sugar and saturated fat. Eat together at home and you’re probably on your way to a better meal. • Delegate: Older kids an share some meal prep duties. It’s good for initiate communication without being “face-to-face”. Make sure to thank them for their help, too. It reinforces that they’re appreciated. • Convenience if OK: Bagged greens, frozen veggies, and yes, canned foods like beans and tomato sauce are nutritious and save time. I encourage them. • Set it up: before work, set the table, get out any pots or pans you’ll need, and anything non-perishable. It really shaves valuable time later. Eat more slowly, do more talking. The food won’t go away and you’ll enjoy it more. If the kids are done eating sooner, then have them stay for the full 30 minutes to make conversation. Make it a family tradition and try doing it as often as you can, because #FamilyMealsMonth matters, and it matters all year long. 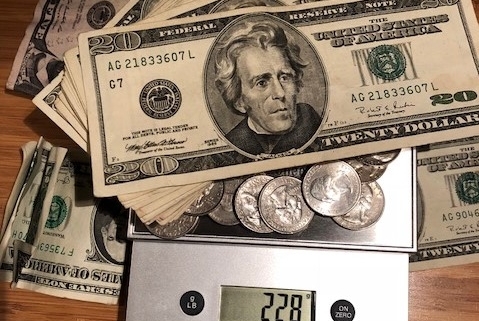 Could Losing Weight Make You Richer? Well, yes and no. It won’t automatically add to your bank account, but according to this study you’ll probably spend less on health care. Reducing weight reduces health risks – and what they cost you. The authors studied data between years 2001-2015 from the Medical Expenditure Panel Survey (MEPS), an annual survey that uses a nationally representative sample of adult civilians. They looked at the additional cost of being obese, compared to a non-obese person with the same condition. They combined the costs for obesity-related illness from all “third-party payers”, including Medicare, Medicaid, private insurance plans, and patient “out-of-pocket” spending, other than for over-the-counter medicines. The results are worrisome – and costly. Out of the 334,000 adults surveyed, 30%, or 99,000, had a body mass index (BMI) over 30, indicating obesity. This is no surprise, as other national surveys have shown similar percentages. This percentage would double if they had included people who were merely overweight, with BMI values between 25-29.9. That might not seem like a huge change, but it amounts to a 29% increase, compared to someone with the same condition who is not obese. Some states, such as Ohio and Wisconsin, fared even worse, with increases over 40%. The authors quoted several studies that suggest associated a higher BMI with lower wages, but for women only, not men. Weight-related discrimination in the workplace has also been documented. Indeed, there is less chance of being hired because of weight. Then there are the issues of obesity-related health problems causing more missed days due to illness, more physician visits, more medication costs. When you add it all up, shedding a few pounds starts to make financial sense, not just healthy sense. Who wouldn’t rather put that money to better use if they could – and you can. This study showed national averages but you’re not a population, you’re you. Everyone is different. You can’t change national numbers but you can impact your own. Losing 100 pounds is not necessary to be healthier and reduce obesity-related risks. This review of weight research studies documented that even losing 5% of your body weight will produce health benefits. Weigh 200 pounds? That means if you release 10 pounds you’re healthier. Hold that for a year and I’m your biggest cheerleader. I wouldn’t care if you made one small positive change to your diet or lifestyle each month. Just do what you can commit to and know it’s moving you in the right direction, health-wise, and money-wise. In fact, if you’re making changes you notice quickly, you’re probably making too drastic a change. OK to slow down, take a year to lose 12 pounds – a pound a month. If that gets you to the 5% solution, you’re already saving money on health care costs. 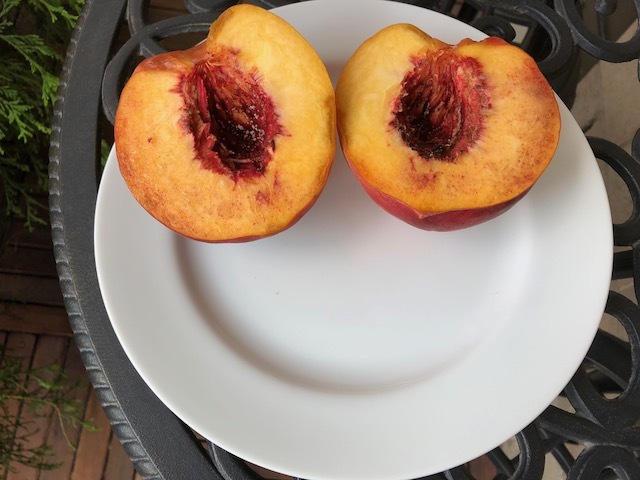 BTW — This is a pic of a huge California peach on a “smiling” dessert plate. It WAS dessert, amazingly delicious all on its own. http://cuttothechasenutrition.com/wp-content/uploads/2018/08/Money-on-food-scale4.jpg 548 479 Keith-Thomas Ayoob http://cuttothechasenutrition.com/wp-content/uploads/2016/10/logo10.png Keith-Thomas Ayoob2018-08-29 10:11:472018-08-28 16:55:56Could Losing Weight Make You Richer? Direct & “Indirect” Food Additives: Issues Or Non-Issues? The American Academy of Pediatrics recently released a policy statement on food additives — the direct food additives like nitrates, and indirect ones, like plastic containers that come into contact with food. Their bottom line is that the FDA’s regulatory process doesn’t properly vet food additives and cannot assure us that all of these 10,000 “chemicals” [emphasis mine] are 100% safe. I like the AAP – really I do – but in this case I wonder if they’re presenting a balanced view of the total body of science on food additives. For example, the statement references studies where additives are “linked” to conditions like impaired thyroid function and immune responses to vaccines, even increased risk for obesity. Yet, many of the referenced studies also admit that such “link” may not be one of cause-and-effect. Moreover, numerous studies not referenced validate the safety of these additives. Getting approval of a new food additive just isn’t easy – nor should it be. Not likely, and that includes prescribed medications, but that doesn’t mean we shouldn’t use them when necessary. It would be easy to get suspicious of everything we eat: Are healthy foods like beans 100% safe for everyone? It’s more useful to me and my patients to put this issue perspective, and to that end I think the AAP statement could have done that better. We DO have the most advanced food delivery system in the world and our FDA is a guide post for similar organizations in other countries. If someone is eating processed meat frequently, I’d be more concerned with what it’s replacing in the diet, rather than nitrates per se. Let’s balance the diet and the nitrates become a non-issue. As a pediatric nutritionist for over 30 years, I’d love it if we lived in a world without a need for anything “additive”. But we don’t, and in some cases that’s a good thing. After all, food additives have provided some of the best public health interventions. I’m glad I don’t have to see children with neural tube defects anymore, now that folic acid – a food additive – is added to enriched grains. My own mother remembers her grandmother having a goiter and to this day she will only use iodized salt. No fancy sea salt, not even Kosher salt, for her. “You never had to see anyone with a goiter,” she says. The AAP calls for the FDA to re-examine the regulatory process for approval of food additives, including those additives on the “GRAS” (generally regarded as safe) list. They also note that low-income children are at increased risk, as higher consumers of packaged foods. As for affordability, I like that the AAP recommends practitioners “develop a list of low-cost sources of fruits and vegetables.” I’ve worked my entire career with low income patients and helping patients stretch their food dollars goes hand-in-hand with good medical nutrition therapy. Nothing is nutritious until people eat it. • Make fresh fruits and veggies a big priority in the home eating environment. (Uh, it helps if parents eat them, too, and in front of the kids). • When microwaving food, put it onto a plate or in a glass container instead of plastic. It just saves worrying about whether the container is microwave-safe to begin with. Also, no plastic wrap when microwaving. Too hot and the stuff melts. Ick. • Forget the dishwasher for plastic containers. Just wash them by hand. Done. Finally, if you’re doing these things anyway, then you’re also already minimizing your exposure to food additives. Then the feds can take all the time they want. You’re doing your job and that’s plenty safe. http://cuttothechasenutrition.com/wp-content/uploads/2016/10/logo10.png 0 0 Keith-Thomas Ayoob http://cuttothechasenutrition.com/wp-content/uploads/2016/10/logo10.png Keith-Thomas Ayoob2018-08-20 08:35:462018-08-17 20:56:22Direct & "Indirect" Food Additives: Issues Or Non-Issues? Dark Chocolate: Does More = Less for BMI & Waist? This recent meta-analysis looked at the effects of eating dark chocolate on body weight, body mass index (BMI) and waist circumference. • It included randomized controlled trials (RCTs) only. That means “cause-and-effect” results of an intervention. Large population studies can’t do that (no matter what the headlines imply). • The studies in this meta-analysis all had to investigate cocoa’s or dark chocolate’s (DC) effect on body weight, body mass index (BMI) and waist circumference . • Neatness counted. The authors of this meta-analysis looked only at studies with adults. No animals. First the bad news: Glass half empty? There was no significant effect of dark chocolate/cocoa supplementation on BMI, weight, or waist circumference. Bummer. Some studies found a difference, some did not, but when you pool all the studies together and treat them as one huge study, which is what a meta-analysis does, no significant difference in these parameters could be found. • There was a significant reduction in BMI and body weight. • Waist circumference was reduced but only in doses of 45-60 grams daily. Here are a few of my latest fave bars. 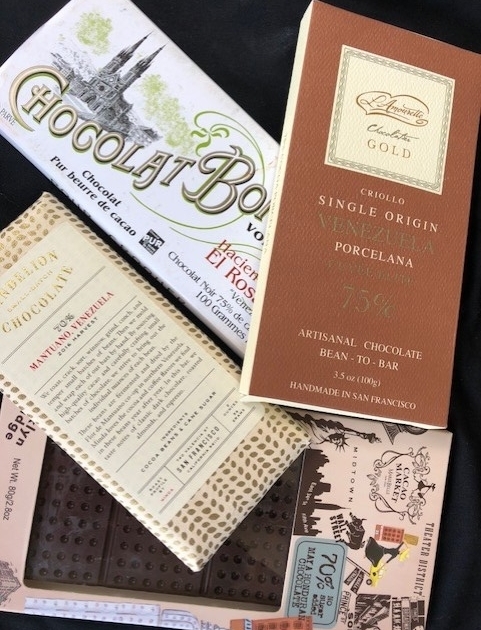 They’re pricey, but good chocolate isn’t for gulping. Learning to savor our food just adds to the enjoyment. http://cuttothechasenutrition.com/wp-content/uploads/2016/10/logo10.png 0 0 Keith-Thomas Ayoob http://cuttothechasenutrition.com/wp-content/uploads/2016/10/logo10.png Keith-Thomas Ayoob2018-07-23 09:57:162018-07-27 14:28:23Dark Chocolate: Does More = Less for BMI & Waist? Lean Red Meat in a Mediterranean Diet? Oh, Yes You Can! This post is a collaboration with Beef. It’s What’s for Dinner., on behalf of the Beef Checkoff, as part of my role as a member of the Beef Expert Bureau. In my previous EdibleRx column, I discussed the PREDIMED study, a 2013 landmark multi-center trial that showed how following a Mediterranean diet could reduce the risk of heart attack, stroke, and cardiovascular disease, but that was recently retracted due to flawed methodology. The re-analyzed and republished data showed good, but less dramatic results, than when first published. Among the hallmarks of a traditional Med diet, one that the typical Greek farmer ate, are the inclusion of olive oil as the preferred fat in cooking, lots of fish, fruits, vegetables, and minimal red meat. Oh, and the glass of red wine. Red meat? That Mediterranean farmer didn’t eat much because not much was available. Cows were expensive and sheep worked better on the arid land, plus they gave wool and milk to make feta. All based on pragmatism, not fashion. Red meat (usually lamb) was a celebratory dish. My Greek grandfather loved roasting the lamb heads at Easter (knock it, but farmers waste nothing). A new study asks the question: What would happen to cardiovascular risk factors if you ate a Med diet but compensated/replaced some (up to 18 oz/week) of the poultry with lean red meat, keeping consumption of fish, extra-virgin olive oil (EVOO), nuts, and the rest of the Med diet the same? This study, in the American Journal of Clinical Nutrition, has some credibility. It’s small, but well done, and it’s a “cross-over” design, so that every participant followed both the Med diet limited in red meat and the Med diet that included red meat (i.e. Med-Red) for 5 weeks each, with about a month in between each phase. • The Med-Red diet lowered total cholesterol significantly more than the Med diet limited in red meat. • The Med-Red diet lowered LDL-cholesterol, but the Med diet limited in red meat did not. Blood pressure improved in both groups, regardless of red meat intake. HDL-cholesterol, glucose levels, and insulin were similar and unchanged for both groups. • Is the advice to reduce red meat intake in a Med diet misguided? • What about lean forms of deli meat (beef and pork)? Interestingly, when I looked at the revised PREDIMED data, specifically the questionnaire that scored the adherence to the Med and control diets, at the 1-year, 3-year, and 5-year follow-up marks, there were no differences in consumption of red or processed meats between the Med diet groups and the control groups, even though the Med diet groups had a lower risk of stroke. Maybe it’s not the red meat that makes the difference here. Limitations? ALL studies have them. This study was smaller and didn’t last as long as the PREDIMED study, which had a 5-year follow-up. The study was funded partially by the Beef Checkoff and the Pork Checkoff, but before you make pre-judgements, it was also funded by the National Institute of Health’s Ingestive Behavior Research Center at Purdue University and NIH’s Institute of Health’s Indiana Clinical and Translational Sciences Institute, all reputable organizations. Regardless, the funding organizations had “no role in the design or conduct of the study; collection, analysis, or interpretation of the data; or writing of the manuscript.” The study was fully peer-reviewed. • Stop worrying about “red meat” and focus more on leanness and freshness (i.e. unprocessed). • Beef in particular has a lot to offer nutritionally, especially nutrients like zinc and iron, but also conjugated linoleic acid, B-vitamins, and more. • Make sure you have it with plenty of veggies and some whole grains, dressed with a drizzle of EVOO. If you want a great lean beef recipe I made, check out my recipe for an easy, lean, tasty pot roast here, or for many more check out Beef-It’s What’s for Dinner and this infographic on the Med Diet. The site is loaded with great, heart-healthy recipes. http://cuttothechasenutrition.com/wp-content/uploads/2016/10/logo10.png 0 0 Keith-Thomas Ayoob http://cuttothechasenutrition.com/wp-content/uploads/2016/10/logo10.png Keith-Thomas Ayoob2018-07-13 09:40:322018-07-30 16:55:01Lean Red Meat in a Mediterranean Diet? Oh, Yes You Can! But the Mediterranean diet did get a kick in the keester. The New England Journal of Medicine just published a retraction of the 2013 PREDIMED study because of flaws discovered in the randomization methodology. Basically, it found that about a fifth of the 7447 trial subjects weren’t randomized properly, which could have allowed bias to creep into the data. PREDIMED was a study on the Mediterranean diet and its impact on cardiovascular disease, specifically heart attack, stroke, and cardiovascular-related death. The study was intended to go on for 7 years but was stopped after about 4 years because the results were so dramatic that it was considered unethical to prevent the participants on the control diet from benefitting from the Med diet. • General advice on a low-fat diet. After 3 years, this group would also have additional dietary instruction. Where did things go awry? For about a fifth of the 7447 participants, randomization didn’t happen. They point out several ways the randomization failed for these participants, and these failures didn’t seem intentional or malicious. Probably due to site technicians who were poorly trained, poorly supervised, or sites that just weren’t run efficiently. The authors completely re-analyzed the results of the study and published them here. Did the corrected analysis change the results? Yes. The results are still good, but not as dramatic. The Med Diet with either nuts or EVOO showed benefits only for reducing the risk of stroke, but not heart attack or other cardiovascular event. We shouldn’t dismiss the Med diet though. Although the PREDIMED study had flaws, other Med diet studies have shown positive results. • It’s simple and sustainable. • It uses easily obtainable foods. • It doesn’t require major dietary changes, yet still has at least some cardiovascular benefits. As a clinician who has spent years helping people change their eating behaviors, a diet with these attributes hits the tri-fecta. • Why are homemade pastries OK but “commercial bakery” items discouraged? • Why are “red and processed meats” grouped together? More to the point, why is lean red meat in the same category as fatty, salty sausage? • There is absolutely no mention at all of dairy foods, milk, yogurt, or cheese, either low-fat or regular? Yogurt and cheese are nutrient-rich and present in a Med Diet, even if not adequately so. 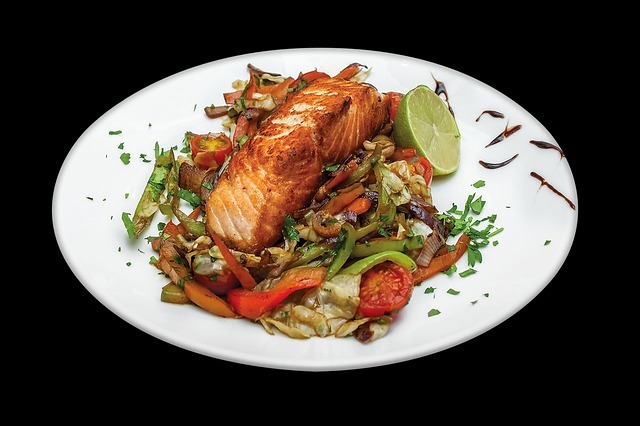 It combines the best of the Med Diet with the DASH (Dietary Approaches to Stop Hypertension) diet. Both emphasize lots of fruits, vegetables, legumes, but DASH makes up for what’s missing from the Med Diet and the diets of most people: dairy nutrition. The Med Diet, for all it’s advantages, is low in calcium. Even the 2015 US Dietary Guidelines for Americans, which praises the Med Diet, acknowledges the likely lack of adequate calcium in the Med Diet. A calcium supplement alone cannot replace the nutrition-rich package in dairy foods. With a MediterDASHean Diet, you just do the Med diet but include at least 2 servings of dairy foods daily – full-fat, low-fat, or non-fat, whatever your calorie needs allow. Personally, I get three servings and happily so. The Med diet discourages “red and processed meat” but it’s not clear why. It’s even less clear with a new dynamite study that looks at what happens when a Med Diet swaps out lean poultry for lean beef and pork. It’s my next post, so watch this space!